I think I originally heard about Shibuya seeing pictures of their iced desserts on Instagram, but once I had done a little more research and discovered that Shibuya was well known not only for its desserts, but also for its authentic Japanese menu, it was soon on my list of places I had to visit. I am really interested in Japanese culture and several years ago came across a BBC documentary called Geisha Girl, following a girl who decided to leave her family to become a geisha. During this, the girl and her geisha sister went to a café and ate a shaved iced dessert. I was really curious about what it was. 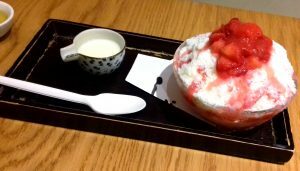 So I was really excited when I discovered it is a dessert called bing or bingsu, originally a Korean dessert but also popular in Japan. Finding that a little restaurant in Soho served this dessert I have been so keen so try meant that the next time I visited London, I knew I had to go and eat there. 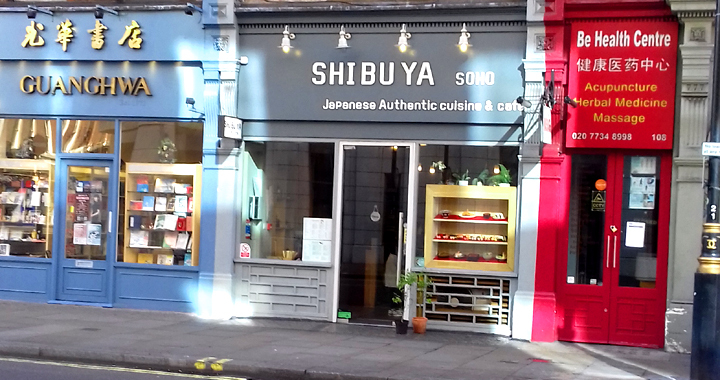 Shibuya is a small Japanese restaurant on Shaftesbury Avenue. It is the sort of place you probably wouldn’t really notice unless you knew it was there. Inside it is more like a café than a restaurant, as a lot of small Japanese places are. We were shown to the lower floor where there are half a dozen tables beyond the couple on the upper floor. Here you are also sat overlooking the kitchen, so you can watch the magic happening and the chefs at work. The restaurant is well known for being very busy and people queuing to get in, but we were lucky that although it was a Saturday, it was early lunchtime and we got a table straight away. The menu had a choice of appetizers, which we didn’t have, and then sushi, noodle and rice dishes. The explanations of the dishes assume you will know what they are, but the staff were friendly and helpful when I started asking what was in various dishes. 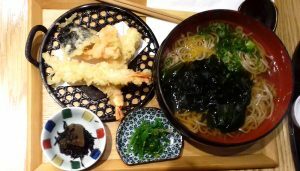 My husband chose the prawn tempura noodles with soba noodles (there was a choice of soba or udon) and I chose fried rice with eel. We chose to drink tea (green for me and oolong for my husband) to go with it, but it was nice to see homemade yuzu and grapefruit ades as more unusual soft drink options. When our food came I was surprised by the large portion sizes. Served on wooden trays, both our dishes came with an assortment of tsukemono, or pickles and salads. Mine came with a bowl of miso soup, wakame salad, a shredded cabbage and carrot salad with a wasabi dressing and a pickled vegetable with hijiki seaweed. My husband’s meal came with the wakame salad and the pickled vegetable. The tempura was perfect and the soup the noodles came in a delicate salty, citrusy flavour. 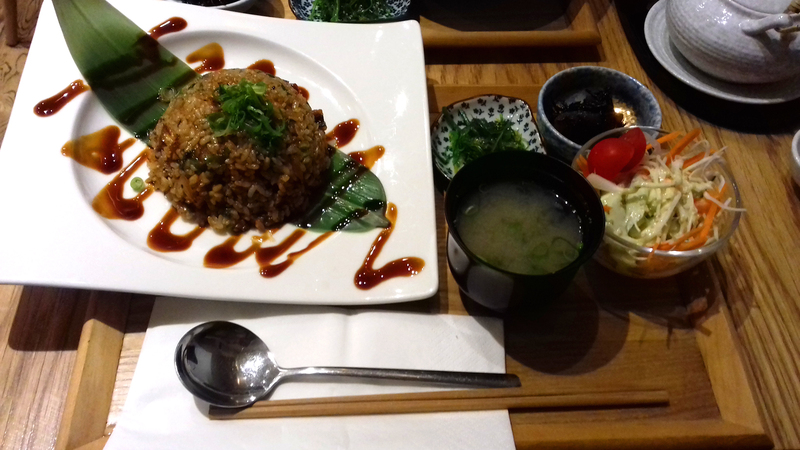 The eel fried rice was really tasty and something a little different as I quite often pick ‘safe options’ like chicken at restaurants. The eel was well cooked and tasted great without being too fishy. The pickles and salads went alongside our mains really well. I’ve heard that people feel Shibuya is expensive, but the prices seemed quite reasonable for the portion sizes- the mains were about £10-£15 and the bing £6 in a regular size. As the portion sizes were on the larger size, I was quite full once we had finished. Shibuya also do Japanese cakes, but I had to order a bingsu, as this was one of the main reasons for coming- and, judging by the number of tables around us with dishes of bing, most of the other customers had come for the same reason. There were five different options, but I was torn between the matcha bing (with green tea) or strawberry bing (with fresh strawberry), finally opting for the strawberry in regular size, which was enormous- I wonder how big the large is? We were told by the staff that there could be a ten to fifteen minute wait but it was certainly less than ten before they brought it to us. The dessert is a shaved cloud of sweetened iced milk in tiny snowflakes, the texture somewhere between ice cream, gelato and sorbet. The strawberry bing had chopped fresh strawberry layered throughout it and on top and was served with a little pot of condensed milk for drizzling. It is difficult to describe just how tasty the bing really is. Creamy, smooth, cold and sweet, it is so different in texture from anything I’ve eaten before, but this added to its charm and appeal. My husband tried it and likened the flavour to a Wall’s Mini Milk ice lolly from our childhoods and I know what he means. I have to admit after about three-quarters of the way through it, I did start to feel rather full though! Between us we managed to finish it. The strawberry bing is reason enough to visit Shibuya and try something truly different, but I really like that Shibuya gets their food so right, rather than doing mediocre mains and fantastic desserts and I think this is why it is consistently so busy, as with so much local competition, people are returning for the additional advantage of a really unusual and extremely tasty dessert. It is well worth a visit to Soho to visit Shibuya and try their authentic food, traditional atmosphere and décor and of course, their tasty bing desserts. It is like a little slice of Japan in the heart of Soho. Posted in Restaurant Reviews, Reviews and tagged Restaurant, Review.